Okay, to say this cake will make you famous might be a slight exaggeration, but you will be hailed as a marvelous baker. And you're the only one who needs to know how very simple it is to make this scrumptious four-layer coconut cake. You'll also need eggs, oil, and water. Mix up the white cake according to package directions. You can use any cake mix that makes you happy (or, if you're like me, you'll use the one that was on sale). If you don't care for cake mixes, simply mix up a white cake from your favorite recipe. Prepare two round cake pans; divide batter evenly between the pans. HINT: If you have a food scale, use it to make sure your batter is divided evenly. Otherwise, just eyeball it. Bake layers according to package directions. Allow the two cake rounds to cool thoroughly. When cake layers are completely cooled, cut them in half horizontally. You'll be creating four layers. I use a long serrated knife for this process. Don't worry if the layers aren't perfect. Place one layer, cut side up, on a cake plate. It's best to use a plate with a lip, since your filling/frosting will be fairly runny. Spread 1/4 of your filling/icing on the first layer. HINT: Again, if you have a food scale, use it to make sure you're using 1/4 of your filling for each layer. You'll have 36 oz. of frosting, so use about 9 oz. per layer. If you don't have a food scale, just eyeball it. . . but if you do have a food scale, it's useful for making this cake just right! Continue stacking each layer, cut side up, on top of one another, topping each layer with 1/4 of the filling. When you've stacked the last layer and spread the last bit of filling on top, you may want to sprinkle a bit of flaked coconut (I like Baker's Angel Flake) on top just because it looks pretty. Now here's the most important part. Cover the cake well (I cover it with plastic wrap first, then also with foil) and refrigerate it for at least TWO DAYS before serving. Three days would be fine, too. But it needs to sit for at least two days to give plenty of time for the yummy filling to sink down into every crevice of the layers--the layers that you placed CUT SIDE UP, remember? After two days the cake will be moist and cold and absolutely irresistible. If you're lucky, your 18-year-old will ask you to bake one for his birthday. If you're really lucky, he might be a handsome redhead who is more than foot taller than his mom. Oh, Wow. That looks amazing! It looks like your son has a great group of friends :) Love you girl. Oh my! I must make that cake! I have never seen frozen coconut out west. Is it unsweetened? I can't believe how tall your son is....wow! I agree, he is handsome. I make that very same cake but we cover it with Kool Whip! looks absolutely delicious!!!!!! and of course, your son looks really happy!!! LOL - I love the title of your post! That cake looks just amazing. I love coconut - I must try making this one day! 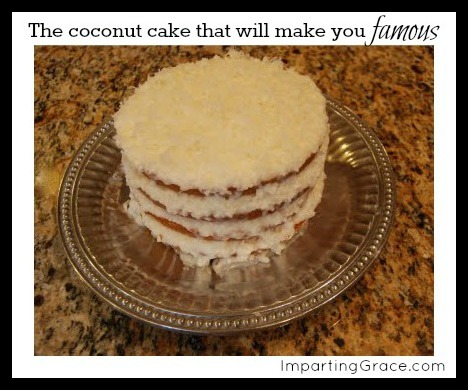 My mother would adore this as she loves a good coconut cake. Yours looks mighty good! That looks wonderful! THat Preston is a lucky boy, err guy, um man? He must be pretty wonderful to have so many friends there to celebrate with him. Thanks for the tip about using the scale. That's brilliant!!! HI, sweet Richella! I want to come to your house & eat cake. The cake looks delish! And I just caught up on your last few posts - you should be very proud - what a nice young handsome guy you have there!! Oh yum! I know I would love this. My grandma used to make a coconut cake every Christmas. Unfortunately, I'm the only one in my immediate family who likes coconut. Boo! This looks sooo good, it has me salivating! Being "famous" with my kids and their friends is good :). Amazing . . . I made this exact cake for my dad for Father's Day! It was awesome!!!!! So glad I found your blog! Oh my gosh! Without knowing it was you, I clicked on your link (from Beth's party)simply because of the title! Hilarious! I am madly in love with anything coconut, so I am totally going to make this. When no one is around. And I can eat it all by myself. :) You're much better than me for sharing! Ryan recently wrote a post about how much he loves coconut. . .you might want to share this with him!! I should have known. . .
Dinner for Real: It's back!